Ah — prunes. Your grandparents likely ate them, and not because they are sweet and surprisingly tasty. It’s likely they ate the dried fruit to treat constipation. It’s no wonder then that prunes have fallen by the wayside these days when it comes to including these healing foods in the weekly diet. Preventing constipation is not always at the top of the list when considering your nutrition health. But the humble prune still makes an excellent alternative remedy for promoting regular bowel movements. And a healthy digestive system that removes toxins and wastes efficiently keeps the rest of you healthier, too. In a recent clinical trial conducted at the Department of Internal Medicine, University of Iowa, researchers tested the ability of prunes to relieve constipation. The prefaced the results of their study with the following comments: “…treatment of chronic constipation remains challenging with 50% of patients dissatisfied with [their] current therapy.” They go on to note that there is an unmet need for natural and safe alternatives in the treatment of constipation. The research team then set out to assess and compare the effects of dried plums to those of psyllium in patients with chronic constipation. Forty constipated patients were recruited for the trial. The participants were enrolled in an eight-week, single-blind, randomised cross-over study. They received either dried plums or psyllium for three weeks each, in a crossover trial with a one-week washout period. The participants kept a daily symptom and stool diary. The researchers found that the number of complete spontaneous bowel movements per week and stool consistency scores improved significantly with dried plums when compared to psyllium. They concluded that dried plums are safe, palatable and more effective than psyllium for the treatment of mild to moderate constipation, and should be considered as a first-line therapy. 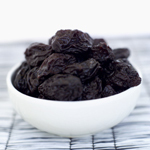 Not only are prunes great for treating constipation, but they are also good at fighting free radical damage to cells. Prunes contain high amounts of unique phytonutrients called “neochlorogenic” and “chlorogenic” acid. These damage-preventing substances are particularly effective in neutralizing a dangerous free radical called “superoxide anion radical.” The two phytonutrients could also help to prevent oxygen-based damage to fats. When you consider that your cell membranes, brain cells, and molecules such as cholesterol are largely composed of fats, preventing free radical damage to these fats is a very important job that prunes can perform. One more health benefit of prunes: they are a good source of potassium. Potassium helps to maintain normal blood pressure and heart function.